UCaaS is a PBX in the cloud, its a telecom application (granted a complex one, but a telecom app nonetheless). CPaaS is a telecom application server in the cloud, upon which telecom apps like UCaaS run. CPaaS can also expose a plain vanilla SMS API. BUT the key is CPaaS generally includes a telecom app server. See above diagram. That’s it. There isn’t that much more complexity to it from a network perspective. Now, there is the UCaaS client which runs on the phone / laptop, it can be just a web browser; however, I’m skipping over all the client stuff as my focus is on the network / cloud. Most UCaaS run on a dedicated CPaaS instance, and only expose UCaaS APIs. 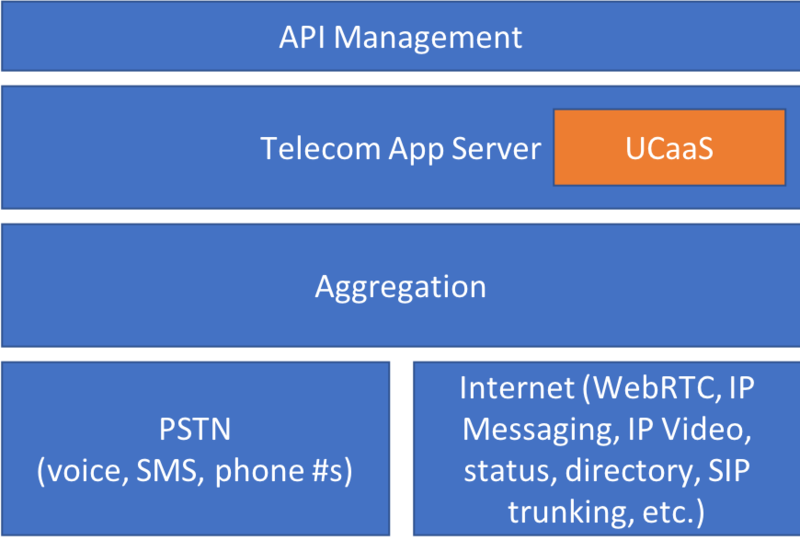 Both UCaaS and CPaaS require voice / SMS aggregation, SIP trunking, number provision, etc. Else your UCaaS isn’t making any calls or SMS with the PSTN, unless you bring your own telco. The main difference between UCaaS and CPaaS is how they are sold/bought. UCaaS is an enterprise telecom service, a replacement for the old PBX or IP PBX (yep, even IP PBXs are getting replaced these days), its all about seats and enterprise telecoms. Plus UCaaS updates enterprise telecoms with all the cool stuff we’ve grown accustomed to from Skype, Wire, Slack, WhatsApp, such as multi-device, conversation history, and collaboration. UCaaS wraps it all up into a service the enterprise can control and integrate into its business processes. Most enterprises do not actually want unified communications, they just want modern easy to use enterprise telecoms that makes them more competitive and saves them money. But that discussion is another weblog. CPaaS is an enabling platform with a laundry list of telecom services and capabilities available either directly from the CPaaS provider or its ecosystem. CPaaS allows you to create not only UCaaS but CCaaS (Contact Center as a Service), UC&C (Unified Communications and Collaboration), omni-channel bots, emergency alert services (like we saw in Hawaii), 2FA (2 Factor Authentication), and lots lots more. It also exposes plain vanilla aggregated PSTN and Internet telecoms APIs. Telesign is a good example of a CPaaS that focused on 2FA to grow its business, a telecom app that runs on its CPaaS. Confusion does comes from applications like web widgets and omni-channel bots. Those can be sold as an app on UCaaS (yes UCaaS have app stores these days), or bought / built on a CPaaS. Those applications will not be sold per seat, rather per enterprise admin account. Its the same app, just bought through 2 different brands, the UCaaS provider or the CPaaS provider / its partner. Which should an enterprise choose UCaaS or CPaaS? It depends on what they want to do, are they replacing their old PBX (then its UCaaS) or building / adding a web widget to their website (CPaaS or a specialized service that uses a CPaaS provider). We’ve talked about the complexity of UCaaS in Europe, as the enterprise telecoms ecosystem is complex with lots of history. Focusing upon just technology acronyms like UCaaS and CPaaS ignores the reality of how enterprises buy telecoms. Generally they will need UCaaS and likely use CPaaS either directly or through other service providers. However, UCaaS is adding contact center, collaboration, IoT, and web widgets capabilities. Which given its built on CPaaS is not a surprise. So an enterprise can buy a bundle of enterprise telecom services from a UCaaS provider, not just the PBX replacement. As an example of a company that is ahead of this curve in this space, Apifonica is a CPaaS (check out below their great intro video from TADHack Global last year), Dzinga is a UCaaS which runs on an Apifonica instance and is sold to enterprises. Two brands for two categories of services that are sold differently, but run on a common platform. Its up to the enterprise customer to choose what makes sense given their specific needs. Maybe in time it will all consolidate into a few global specialists in enterprise telecoms at different layers in the technology / service delivery stack, but that is decades away. 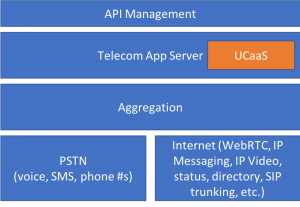 To repeat the title of this weblog “UCaaS is a subset of CPaaS”. Don’t forget to register for TADHack-mini Orlando, you’ll experience first-hand CPaaS and UCaaS. Gaining valuable knowledge in making the right decisions for your business needs. As Albert Einstein said, “The only source of knowledge is experience.” TADHack-mini Orlando will give you that experience in UCaaS and CPaaS.